Deborah Serani, Psy.D. 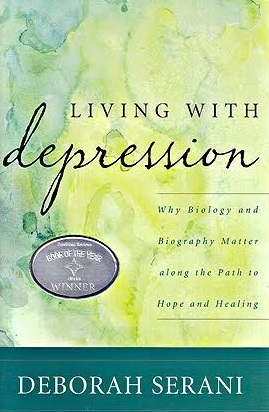 is a psychologist whose clinical specialty is depression. She is a professor at Adelphi University and has been a TEDx speaker as well as a columnist at Psychology Today and Esperanza Magazine. Dr. Serani was also a technical advisor for the NBC television show Law & Order: Special Victims Unit and has a recurring character named after her - Judge D. Serani. Dr. Serani has written award-winning books for Rowman & LIttlefield Publishing Group and Free Spirit Publishing. I’m a great listener. Not just great, uber great. Like an Olympian. If awards were given out for the best listener, I’d get the gold. As a psychologist, listening is not just a skill of being present and hearing the person you’re working with. It’s an active kind of silence, taking in what the person says, how it’s being said and processing meanings, feelings and other threads of the person’s experience. It’s a skill, but the practice of listening really is an art. Patience. I’d say that’s one of my best qualities. Whether it’s finding myself in a difficult moment and taking the time to consider where, what or how I do something next - or helping another person in a time of need, having the ability to be thoughtful, patient and present makes me feel confident as a person. Personally, I’ve always wanted to be someone other people consider as kind. That’s always been my own humanistic goal for myself. To be kind to others. To be kind to myself. It makes me feel good to be kind and when kindness touches another person’s life, I find that connection meaningful too. Professionally, my goal is to help destigmatize mental illness, specifically depression. As someone who’s lived with it as a child, and learned to treat it as a psychologist, my dual experience of knowing depression is quite unique. I use my own personal experiences with depression and my professional training to reach and teach others. Living with mental illness shouldn’t be shameful. And when more people talk about their own experiences with depression, it helps take the shadow of stigma away. I consider the publication of my 2011 award-winning book “Living with Depression” by Rowman & Littlefield Publishing Group to be the greatest accomplishment. It’s a part memoir, part self-help book on living well in spite of having depression. When I was 19, the grips of my depressive illness worsened to a dangerous place - and I attempted suicide. It was the most challenging moment of my life, and continues to be a place in time that’s hard to really linger and visit. But, the moment itself set into motion life changing experiences for me: getting help, finding psychotherapy, recovering from my illness and choosing psychology as my career. I use the Japanese proverb, “Fall down seven times, get up eight.” It’s a phrase that reminds me though my depressive symptoms may be hard to deal with some days, the goal is to always find a way to get back up. It helps me see that challenge comes in many forms, but resilience is where your focus should be. So, don’t fret that a bad moment happens (because they always will). Instead, aim for the dust-off, the get-back-to things moment when it comes. And celebrate that. My favorite people are my hubby and daughter, and the time we get to spend every day together. One of the things I learned very young when I was depressed and suicidal was not to take any moment for granted after I recovered. The simple things are just as special and the big occasions, and being with the people I love the most is a singular joy unlike any other. On bad days, my favorite place is my bed - and my cat, Elvis, who helps me refuel when depressive symptoms bear down on me. On good days, my favorite place is a sandy beach with blue ocean water. It doesn’t have to be a tropical destination. It could be anywhere, and any season. As long as I can hear the surf, look at the sea, feel the breeze and touch the sand, all is well in the world. I really don’t have any great affinity to things or objects. But I’d have to say that music is a big must have in my life. So, music-making electronics would be my answer. I love nature, so being outside is a great passion. So is listening to music and cooking. I guess a perfect day would be being beside a huge open window in my home, seeing the birds, flowers and trees, listening to some James Taylor, Art Tatum or Cobie Caillat and cooking a great meal for my family.